During the final decade of the 19th century, the right field post on the New York Giants was manned by Mike Tiernan. A quiet, amiable man, Tiernan was well liked by teammates, fans, and the baseball press. But he was not without aspects of a contrary streak. On a team where sporting a prominent moustache was virtually de rigueur, Tiernan remained resolutely clean-shaven. In an era when verbal abuse of opponents and noisy disagreement with umpires were ballpark norms, Tiernan was a gentleman, a player who spoke so infrequently on the field that he was dubbed Silent Mike. And at a time when discontent with management ran so deep that the players formed their own league, Tiernan was one of the few to spurn the movement and remain with his old team. Indeed, Mike Tiernan was one of only a handful of 19th century players to spend his entire major league career in a single city. Idiosyncrasies, however, do not define Mike Tiernan. He was, first and foremost, an outstanding ballplayer. His 1887 arrival in New York soon provided the boost that a star-laden Giants team required to bridge the gap between pennant contender and word champions. And for the next dozen seasons thereafter, Tiernan remained a Giants stalwart, often ranking among league leaders in an array of offensive categories. For both his accomplishments and his demeanor, Mike Tiernan was remembered fondly by New York fans long after he had departed the baseball scene. Michael Joseph Tiernan was born in Trenton, New Jersey, on January 21, 1867, the youngest of three boys born to Irish Catholic immigrants. His father, also named Michael, worked at the Roebling Mills, the sprawling industrial complex that employed many in the Trenton workforce. In time, brothers Owen and John would join Michael Sr., at the plant. Meanwhile, mother Rossana Tiernan maintained the family abode, located directly across the street from another city colossus, Trenton State Prison. As a schoolboy, young Mike excelled at athletics. In addition to exhibiting early prowess on the baseball diamond, he was a blazingly fast trackman and an accomplished ice skater. Mike began his playing career as a left-handed pitcher-outfielder with a Trenton amateur nine called the Athletic Juniors. At age 17, he entered the professional ranks, joining the Chambersburg team in the Keystone Association in 1884. The following year, Mike stepped up to the Trenton Trentonians of the Eastern League, going 17-18 as a pitcher with a .238 batting average in 89 games total. Tiernan re-signed with Trenton for the 1886 season, but financial problems precipitated the club’s demise. He then joined the Eastern League (EL) Jersey City Jerseys as a pitcher-outfielder, but arm miseries restricted him to a 6-4 record in 14 hurling appearances. Tiernan, who disliked pitching anyway, had much more success as a hard-hitting lefty batter. He posted a .332 batting average with a .403 slugging percentage for the Jerseys, leading the EL in hits (123) and runs scored (85 in 89 games). Such an outstanding performance made the teenager a fan favorite, his admirers including ten-year-old Charles Stoneham, later majority owner of the New York Giants. More important, Tiernan’s play attracted the attention of Giants brass. The team was already stocked with six future Hall of Famers (Buck Ewing, John Montgomery Ward, Tim Keefe, Roger Connor, Jim O’Rourke, and Mickey Welch) but still seemed to lack that final component needed for a championship. The addition of Tiernan would rectify that shortcoming. In early 1887, Mike signed with the Giants, but only after the club had agreed to use him as an outfielder, not a pitcher. By now a fully grown 5’11” and 165 pounds, Tiernan’s opportunities to make a favorable pre-season impression on Giants manager Jim Mutrie were hampered by illness. Once fully available for duty, his ball-hawking became a matter of concern, particularly after he made a still-MLB record five outfield errors in a May 16 game against Indianapolis. An emergency outing in the pitcher’s box proved another early season disaster. Inserted in the tenth inning of a tie game, Tiernan promptly surrendered ten runs, leading to a 19-9 Giants loss. What saved Tiernan from return to the minors was his bat. Only a week after his horrendous relief appearance, Mike amassed a pair of triples, three singles, and a walk, good for six runs scored, in a 21-1 drubbing of Philadelphia. As he continued to hit, the local press took notice, the New York Times observing that “young Tiernan is surprising everyone with his clever hitting.” By season end, a .287 batting average, with a .452 slugging percentage and an eye-opening ten home runs, had secured Tiernan a regular place in the lineup and presaged even better things to come for both the young slugger and the New York Giants. In 1888, the Giants (84-47) captured their first National League pennant, with now everyday right fielder Mike Tiernan filling a solid supporting role. Usually hitting in the second spot, Mike posted a .293 batting average and stole 52 bases. He continued his fine work in the post-season, batting .342, with eight runs scored, six RBIs, and five steals in ten games, as the Giants defeated the American Association St. Louis Browns to claim the title of world champions. Tiernan backed up this performance with an even better one in 1889. He led the NL in walks (96) and runs scored (147), and was among the league top five in batting (.335), slugging (.497), on-base percentage (.447), OPS (.944), total bases (248), and triples (14). Every bit of this output was needed, as the Giants had to rally down the stretch to nip the Boston Beaneaters for the 1889 NL pennant. The club then successfully defended its world champions crown, besting the AA Brooklyn Bridegrooms in a post-season match that featured second tier Giants hurlers Cannonball Crane and Hank O’Day in improbable starring roles. For his part, Tiernan hit .289 and tallied a team-high 12 runs. Despite this repeat triumph, the 1889 campaign had been a difficult one for New York. With the original Polo Grounds north of Central Park condemned to make way for a city street, the Giants shuffled between derelict facilities in Jersey City and Staten Island before obtaining suitable grounds for erection of a new ballpark in far north Manhattan. By early July, the availability of a handsome, albeit unfinished, stadium christened the New Polo Grounds had solved the Giants venue problem. But it did not cure the tensions between management and players that pervaded the 1889 season. The situation was particularly tense in New York, as Gotham had become the epicenter of player resentment of the reserve clause, a recently instituted salary classification plan, and other highhanded management practices. As the season progressed, rumblings of player insurrection grew louder. Less than a week after New York had celebrated its second baseball championship, formation of a new major league circuit was publicly announced. Called the Players League (PL), its architect was the Giants visionary shortstop John Montgomery Ward. Among the new league’s principal recruiters were erstwhile Giants Tim Keefe and Jim O’Rourke. Its premier franchise would be a New York club led by former Giants captain Buck Ewing and featuring slugging first baseman Roger Connor and other Giants regulars. And its games would be played at Brotherhood Park, a newly constructed edifice separated from the New Polo Grounds by no more than a ten foot wide alley and the stadium walls. 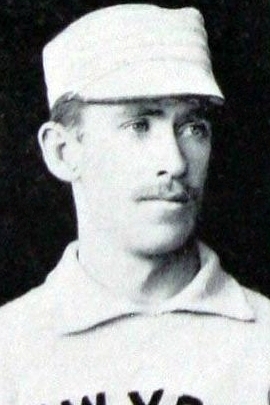 Given these circumstances, it was widely assumed that Mike Tiernan would enlist in the PL ranks, for Tiernan was reportedly “a dyed-in-the-wool Brotherhood man and he wants to play with the boys.” But the young outfielder was not happy with the $2,000 ceiling that the new circuit had imposed on player salaries, as that would entail Tiernan taking a $500 pay cut from the $2,500 that he had received in 1889. NL Giants owner John B. Day exploited the situation, offering Mike a $4,000 contract for the 1890 season. When the Players League declined to raise its stipend to the $2,500 that Tiernan had made the previous season, the issue was settled. Tiernan would remain with his old employer. The revelation that he would not be joining the PL was accompanied by a detailed public statement released by the ordinarily Silent Mike. “I didn’t like the idea of deserting the boys,” said Tiernan, “but now that it is done, I am glad of it.” In explaining his position, Tiernan stated, “I was perfectly willing to play for $2,500. When asked to take 20 percent less, naturally I refused. … I agreed to play for [the PL] for $1,500 less a season than the New-Yorks offered me, and they would not engage me on those terms. I have acted the part of the gentleman in all my transactions, and the members of the Brotherhood can expel me if they see fit.” His mind made up that “he was just as well off in the league at a big salary as he would be with the Brotherhood at a small salary,” Tiernan accepted Day’s terms and signed with the NL club for the upcoming 1890 season. The 1890 season would be a fractious one, with three separate major league circuits – National League, American Association, and Players League – in direct competition. And no fewer than five clubs called greater New York home, two in Manhattan and three across the East River in Brooklyn. But nothing locally compared to the cutthroat rivalry between the NL Real Giants and the PL Big Giants, whom schedule-makers had deliberately placed at home on the same dates. Unfortunately for all concerned, the arrangement backfired, with neither team drawing well. Typical was the attendance at competing home games played on May 12, 1890. Only 1,707 fans attended a PL Boston-New York game at Brotherhood Park, while across the alley only 687 lonesome souls paid their way into the New Polo Grounds to see the NL Boston-New York match – the occasion of the most celebrated home run of Mike Tiernan’s career. As word of a scoreless pitching duel between Kid Nichols and Amos Rusie made its way across the stadium divide, PL fans began migrating to the right field grandstand of Brotherhood Park to spy on the proceedings next door. In the tenth inning, partisans of both New York nines were thrilled when the game was decided 1-0 by a mammoth Tiernan homer – a line shot that cleared the confines of the New Polo Grounds, crossed the alley, and struck the outer wall of Brotherhood Park. A Nichols-Rusie matchup, however, was hardly commonplace in the National League of 1890. NL pitching ranks, like position spots, had been thinned by the PL’s successful player raids. Hitters, like Mike Tiernan, remaining loyal to the older circuit feasted on the NL’s depleted pitching corps. Tiernan certainly had a banner year, batting .304 and leading the league in home runs (13), slugging (.495), total bases (274), and OPS (.880). He was also in the NL top five in triples (21) and stole a career-high 56 bases. Tiernan’s team, as well as its PL rival, fared much poorer, particularly at the gate. The 1890 combined NL/PL New York attendance of 208,864 represented almost 100,000 fewer fans than had been drawn by the venue-troubled NL New York franchise the season before , and both operations lost buckets of money. With the situation no better elsewhere, the Players League folded after a single season, with most of its franchises merged or absorbed by National League counterparts. In New York, John B. Day assumed the presidency of a combined NL/PL club, but the operation was chronically short on funds and destabilized by disharmony in the front office. The merger of the New York teams did not bode well for Mike Tiernan. Ewing, Keefe, Connor, O’Rourke, and other Brotherhood prodigals would be returning to the fold, mindful of Tiernan’s desertion of their cause. The situation at the Polo Grounds III (nee Brotherhood Park) would be an uneasy one, at best, with tension between teammates on the re-combined squad always just below the surface. Fortunately for Mike, most of the returnees were now on the downside of their careers and would not remain in New York long. And in 1891, he would have his third consecutive outstanding season, again leading the league in home runs (16) and OPS (.882), while placing in the NL top five in hits (166), batting average (.306), slugging (.494), total bases (268), and on-base percentage (.388). Mike also scored 111 runs and stole 53 bases. Good things in 1891 were not confined to the playing field, either. That year, Tiernan married Mary (maiden name unknown), the 18-year-old daughter of Irish immigrants. They settled into an apartment in lower Harlem where, in time, the arrivals of William (born 1892), Joseph (1893), and Mabel (1898) completed the Tiernan family. As the veterans of the 1888-1889 championship team departed New York, management expected to rebuild around the likes of Mike Tiernan, still only 25 years old. But nagged by illness and injury, Tiernan would disappoint, putting up significantly reduced numbers in 1892. He batted a modest .289, with only five homers, 79 runs scored, and 20 stolen bases. The club underperformed as well, falling to eighth place in the newly expanded 12-team National League. On the season’s closing day, Giant fans were stunned by news that Tiernan, Amos Rusie, and shortstop Shorty Fuller had all been put on notice of their imminent release. In defending these personnel moves, President Day remarked that Tiernan had “no reason to complain at all. Nearly half the season he has been laid up, and his batting and baserunning have been a sore disappointment. Tiernan was never a brilliant fielder, but we looked for him to make up for this deficiency in batting and baserunning.” But Day’s pronouncement did not fool the sporting press, which promptly reported that the players were being singled out for refusal to submit to pay cuts demanded by the cash-strapped club. Each man had held the Giants to the salary that he had contracted for. Shortly thereafter, Giants executives reconsidered their position. All three players would be back in a Giants uniform on Opening Day 1893. Like most other batsmen, Tiernan benefitted from the pitching rule changes instituted in 1893. The pitcher’s box was eliminated and the hurling distance was elongated to the present 60 feet, six inches. He batted .309, with 14 homers and a career-high 102 RBIs. But given the high- octane offenses of 1893, such numbers were unremarkable. Club fortunes, however, were on the upswing. John Montgomery Ward had returned to New York as player-manager and promptly traded fading Giants icon Buck Ewing to Cleveland for unheralded infielder George Davis. Once in New York, the low key Davis would blossom into a star, turning in batting and fielding performances that would eventually earn him a plaque in Cooperstown. With Davis (.355 BA/11 home runs/119 RBIs) and Rusie (33 wins) leading the way, the Giants returned to the first division in 1893 and held great hopes for the next campaign. In 1894, the club stationed the productive, if disagreeable, Jack Doyle at first and obtained the talented George Van Haltren for centerfield. With Rusie (36-13) ably supported on the mound by Jouett Meekin (33-9), New York surged in the standings, ultimately landing a Temple Cup berth via a second-place finish. But the club improved its standing with relatively little contribution from Mike Tiernan. In a season that saw the batting standard soar to .310 for the National League as a whole, Tiernan hit just .280. And as in 1892, his production was also down across the board in the power departments. Given Tiernan’s age (27) and the absence of any reported injury, the cause for this downturn in performance is not readily diagnosed. But whatever its cause, manager Ward, cool toward Tiernan in any event because of his rebuff of the Players League, did not wait indefinitely for Mike to come around. As the 1894 season wore on, rookie Yale Murphy and others began making their way out to the Giants’ right field spot. Reinstalled in the lineup for post-season play, Tiernan again failed to impress during New York’s four-game Temple Cup sweep of a lackadaisical Baltimore Orioles pennant winner. Of the Giants regulars, Tiernan’s .294 batting average bested only that of light-hitting Shorty Fuller. Still, the club hastened to re-sign the faltering slugger, inking Tiernan to a new pact in February 1895. Tiernan repaid the club’s confidence by turning in three consecutive outstanding seasons. In 1895, he bounced back with a .347 batting average, with 51 extra-base hits and a career-best .527 slugging percentage. He also scored 127 runs and stole 36 bases. Sadly, it was all for naught. The motivational Ward had resigned his post in December to begin the practice of law, and a month later, control of the franchise was acquired by Andrew Freedman, a real estate millionaire and Tammany Hall insider who would soon put the club, indeed, the entire National League, in turmoil. The managerial turnover that would typify the ferment of the Freedman years commenced promptly, with the new owner going through three field bosses during the 1895 season. The team’s ninth-place finish was a harbinger of things to come. Tiernan followed up his comeback season with another splendid performance in 1896. Mike posted career-high marks in base hits (192), batting average (.369), and OPS (.968). He led the NL in games played (133) and was among league leaders in walks (77) while striking out only 18 times in 605 plate appearances. Despite such first-rate work by its rejuvenated right fielder, the Giants, crippled by the season-long holdout of staff backbone Rusie (courtesy of a dispute with team owner Freedman), remained a second-division club. The following year, the return of Rusie and a superb season by Davis (.353/136 RBIs/65 steals) produced a third-place finish, the only time during the Freedman regime (1895-1902) that the Giants would be in the pennant chase. Tiernan contributed his share to the effort, batting .327, with 123 runs scored and 40 steals. Yet in the midst of this stellar season, Tiernan became trade bait, the Giants offering him, pitcher Dad Clarke, and $5,000 to Pittsburgh in return for outfielder-manager Fred Clarke. But the Pirates declined the swap. Thus, Tiernan completed his final outstanding major league campaign a Giant. In 1900, Tiernan occasionally suited up for the Derby Angels of the Connecticut State League, the vibrant minor league circuit organized by his old Giants teammate Jim O’Rourke. In 18 games for Derby, Mike hit .243. But for the most part, Tiernan quietly tended to the Manhattan saloon that he opened on 8th Avenue. Some years later, that establishment was briefly in the news when trashed by the Canary Island gang, a band of local toughs who preyed on neighborhood businesses. Aside from that, Tiernan led a near-invisible existence, occasional visits to the ballpark excepted. Sometime after 1910, he began to exhibit the symptoms of tuberculosis. Leaving oversight of the saloon to oldest son Bill, Tiernan sojourned to the arid West in an attempt to bake out the disease, but to no avail. Returned home, he checked himself into Bellevue Hospital in fall 1918, using the alias Joseph Egan. Mike Tiernan died on November 9, 1918, aged 51. His true identity went undetected until Mary Tiernan was summoned to the hospital days later. Shortly thereafter, Mike’s remains were interred at Gate of Heaven Cemetery in Hawthorne, New York. His memory would be cherished by Giants fans for years to come. 1. Biographical data on Tiernan is sketchy, at best. The personal information provided above was drawn primarily from various US censuses and the material contained in the Mike Tiernan file maintained at the Giammati Research Center, National Baseball Hall of Fame and Museum, Cooperstown, New York. 2. The cabling for the Brooklyn Bridge was manufactured at the Roebling plant, per the specifications of chief project architect John Roebling. The bridge’s principal engineer was his son Washington Roebling. 3. This grim fortress, still in use and now called New Jersey State Prison, has always housed the state’s most serious criminal offenders. 4. As recalled in a Randy Linthurst profile of Mike Tiernan published in the April 1975 issue of Trenton Magazine. 5. Per the on-line SABR Encyclopedia. Note that Chambersburg is a section of Trenton. Other sources, however, have Tiernan making his pro debut with a team in Williamsport, Pennsylvania. See e.g., New York Times, January 10, 1885, and the Linthurst profile in Trenton Magazine. 6. As per the statistics accompanying Randy Linthurst’s portrait of Tiernan in Nineteenth Century Stars, Robert L. Tiemann and Mark Rucker, eds. (Cleveland: SABR, 1989), p. 126. 7. Shortly after Tiernan’s death in November 1918, stock trader Stoneham acquired control of the Giants. In introducing himself to the baseball world, Stoneham revealed that he had rooted for Mike Tiernan while growing up in Jersey City and that Tiernan “was the man who made me a Giants fan. If it had not been for Mike, I probably would never have known [Giants Manager John] McGraw or thought of becoming a club owner. … Poor old Mike is responsible for my entry into baseball. I am sorry that he could not live to see me take control of the New York club,” as quoted in the Toronto World, January 22, 1919. 9. As per the New York Times, March 31, 1887. 10. Mike would make 25 errors his rookie season and would continue to be a sub-par defender for the remainder of his career, his great foot speed notwithstanding. 11. This debacle would constitute Tiernan’s final hurling effort. He finished the season (and his MLB career) at 1-2, with an 8.69 ERA in 19 2/3 innings. 12. New York Times, August 14, 1887. 13. Application of the walk equals base hit scoring rule peculiar to the 1887 season raises the Tiernan batting average to .340. All MLB data for Tiernan are taken from www.Baseball-reference.com. 14. Crane and O’Day posted all six of the Giants wins. Future Hall of Famers Tim Keefe and Mickey Welch went a combined 0-2. 15. New York Times, December 19, 1889. 16. As quoted in the New York Times, December 22, 1889. 17. Washington Post, December 23, 1889. 18. As reported in the New York Herald/New York Times, May 13, 1890, and elsewhere. 20. As quoted in the New York Times, October 7, 1892. 21. According to the Washington Post, July 25, 1897. 22. Inclusion of the walk equals base hit scoring anomaly of 1887 inflates Tiernan’s lifetime batting average to .314. 23. Bill James, The New Bill James Historical Baseball Abstract (New York: The Free Press, 2001), p. 60. 24. As reported in the New York Times, May 11, 1908. At the time, lower Harlem west of 8th Avenue was an Irish neighborhood known as Canary Island. 25. Tiernan reportedly became a New York Highlanders fan, “attending games at (principal team owner Frank) Farrell’s park regularly,” according to the Washington Post, August 20, 1905. 26. As subsequently recounted in the Pittsburgh Press, December 27, 1918. Because Tiernan was an extremely private man, it is difficult to uncover much about his personal life. The circumstances of his final years, including the state of his marriage and the strange events of his death, are murky at best.